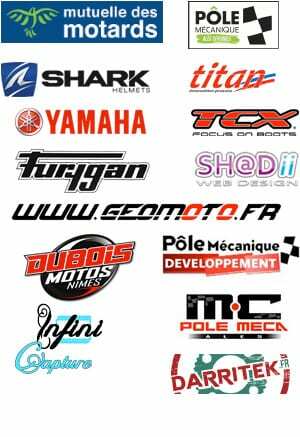 The PÔLE MÉCANIQUE MOTORCYCLE association, located at Vallon de Fontanes, 30520 St Martin de Valgalgues, registered at the RCS of Nîmes under the number 79323569800016, organizes training days for riding motorcycle on closed and approved track. Only customers who have subscribed online will receive a confirmation email.Your place will be reserved for you upon receipt of your payment by cheque within 7 days (subject to cancellation) AND immediately in case of payment by credit card. • By credit card when registering on the website. • By cheque payable to the Motorcycle Mechanics Club to send back WITH your booking number AND registration form to: PMMC, Vallon Fontanes, 30520 St Martin de Valgalgues. • Be in good health and not under the effect of any medical treatment that could change ability to ride a motorcycle. • Be aware of the risks involved in riding on a closed track and thus ensure the proper functioning and good condition of the vehicle used on the track. • Observe the safety instructions given before and after each session (lights, flags). • Hold a valid driver’s license for the vehicle he is using or the motorcycle sport certificate: CASM. • Be insured by an insurance that covers all damage that could cause his vehicle to a third party. • Be able to submit, if it is requested, all documents related to this insurance. • Not to lend your vehicle to another person without the latter himself having taken out Civil Liability insurance and signed this document. • An entry is validated for a driver, not for a motorcycle. • In the eventuality of a personal injury or material accident, the POLE MECANIQUE MOTO CLUB is released from any civil or criminal liability. • The participant assumes his own responsibility in the eventuality of an accident, whatever its nature or its origin, for all the bodily injuries and material that he could suffer on the track. • I agree to pay any invoice to the organization or track direction, in the eventuality that any damage is caused by myself regarding premises or equipment. • We remind you that French law requires all motor vehicles to be insured by their owners, including competitive or similar vehicles, prototypes and non-homologated vehicles. • Cancellations must be made by email, and MINIMUM 30 days before the date for a refund. If the place is resold (by us or by yours) you will be refunded, regardless of the date you cancelled. Either your replacement will pay the amount of the day, or he will pay on the spot and we will refund you later. In case of non-payment of your substitute on the spot, you will not be able to be refunded. • In the eventuality that YOU sell your place, it is YOUR role to contact us by MAIL to give us detailed information of the substitute person. The organization reserves the right to cancel the event before the scheduled date. Participants will be fully reimbursed. No refund will be granted in case of bad weather. Pôle Mécanique Moto Club cannot be held responsible for the cancellation of the driving day in the eventuality of force majeure: inclement weather (snowfall, rain or hail, sleet, fog, strong winds, vigipirate plan, prohibitions / restrictions or conditions imposed by the administrative and sports authorities (prefecture, gendarmerie, federations …) competent. However, each case will be studied and appreciated according to the solutions found with the owner of the tracks. • any participant who has registered for lack of space in a group that is not suited to his level. • any participant or accompanying person who disrespects the organization (including on the internet) and other participants. Participants are responsible for their companions. • any participant with dangerous behaviour on the track or in the paddocks. • any participant who does not respect the noise standards in force. • any participant who does not respect the security flags. • any participant caught using alcohol or drugs. • any participant lending his vehicle without prior notification to the organization. • any participant who has provided false information or falsified documents. • any participant buying a seat from another participant without prior notification to the organization. For non-licensed and uninsured people: Possibility to take insurance in situ. For insured persons covered on track: It is IMPERATIVE to bring a certificate meaning that the rider is covered for the use of his machine on a closed and homologated track. To save time, think to download the registration form, to return it or to prepare it in advance.